If you are a professional / institutional client, please contact us. We have a dedicated team that can provide you with complete information and cater an individual service for your needs. 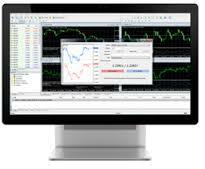 This includes FIX integration, Algorithmic trading support, Liquidity and more. The FIX protocol is a technical specification for electronic communication of trade-related messages. Blackwell Global offers a FIX API for high volume, professional or institutional clients. Tap into our liquidity partners and get access to some of the best pricing available. Please speak with our institutional team to discuss your requirements.